A luxury village house at the very top of Menerbes - a haven high above the most beautiful part of Provence for honeymooners, artists, writers, food lovers, or just plain old romantics. Even when you are in bed there are three different views to choose from - the Luberon mountain opposite, down the valley to the sunset, and over the rooftops of Menerbes. Menerbes was the village that inspired Peter Mayle to write 'A Year in Provence' - it is one of the select group of hill-top villages in the Luberon National Park and officially one of the most beautiful villages in France. Being at its highest point means peace and solitude; while the little shops, cafes, restaurants and village life are a couple of minutes stroll down the hill. More about the house: it is small but perfect. To make the most of the light and the glorious views I have taken out the upper storey and put the bedroom and bathroom on a mezzanine level. I do not know how I was allowed to do it in such a carefully protected village, but the new windows that open onto the Luberon are extraordinarily generous. Eight feet high, and then there is the balcony beyond big enough for breakfast, lunch, and dinner, and with unmatched views, suspended over the full glory of Provence. This is not to mention the sun terrace that opens out from the living room, giving you a bigger plot of Menerbes real estate to stretch out in, sunbathe, take in the view. A word about furnishings - this is not your typical rental home. In fact it is a lot nicer than my real home. It is finished and furnished to a very high standard, with hand-made tiles and furniture, and a hand-made kitchen. There is also free WiFi internet for those who need it. The kitchen has everything you need for civilized living - dishwasher, microwave, washing machine, and waste disposal (try finding these in Provence). And there is another village rarity - an off-street parking spot. The bathroom has a walk-in shower and large showerhead, so it is not a typical French bathroom. The bed is a good-size double (English king size). Menerbes is the heart of one of the enchanted corners of this world. Everything you read about in 'A Year in Provence' is here - the lavender-scented landscapes, daily markets overflowing with local produce that actually tastes of something, hill-top villages rising above the sea of vineyards and sunflowers, outstanding food and wine, and the sensational quality of light that has always brought painters and poets here. In Provence, everything simply tastes, smells, and looks better than at home. And it is all right on your doorstep. •	Choose from an endless number of walks in the 120,000 ha Luberon Natural Park, starting from your doorstep. •	Go to the local markets and rediscover what food used to taste like. •	Long, lazy lunches (and dinners) outside. •	Lose the extra calories by cycling round the famous hilltop villages: Gordes, Bonnieux, Lacoste, Roussillon, Lourmarin, Oppede-le-vieux, etc. •	Antique and bric-a-brac hunting at Isle-sur-Sorgue – France’s antiques capital. •	Explore Fontaine de Vaucluse - the extraordinary source of the crystal-clear Sorgue river (or ride a canoe down it). •	Bump into Princess Caroline at chi-chi St Remy. •	Learn to paint sunflowers. •	Picnic in the cedar forests outside lovely Bonnieux. •	Drive to the top of Mont Ventoux (cycle if you're mad) and let the Alps and the Med take your breath away. •	Marseille, 1 hour away, is France's most exciting city, and home to the world's best bouillabaisse. •	Avignon, half an hour away, is a fascinating medieval city small enough to walk round in a day. 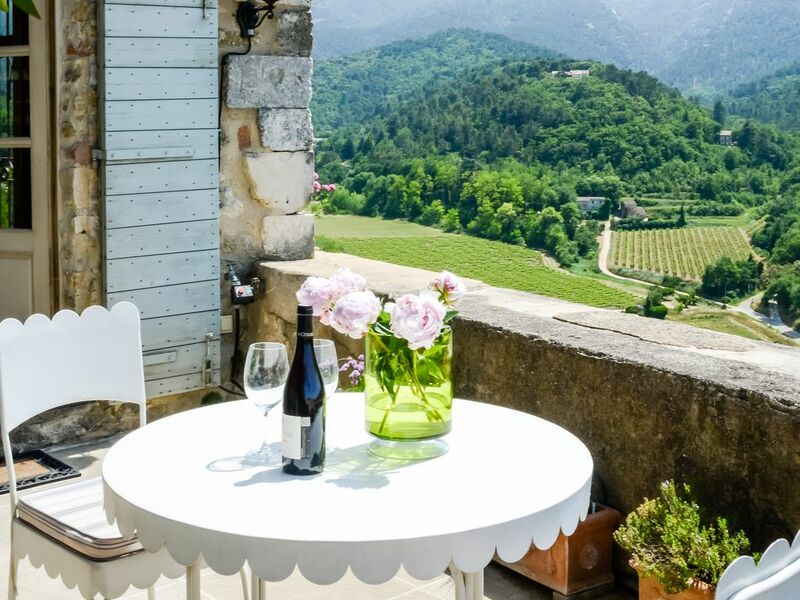 •	Go wine-tasting at the local vineyards or venture just beyond Avignon for some great Rhone wines. •	Day trips to Monte Carlo, Cannes, the Camargue, Arles, Aix, Orange, Gorges du Verdon, Rhone wine trail, even Spain if you leave early. This is a year-round destination - the Luberon in winter is as beautiful in its way as during the long summer that can stretch from May to October. As Peter Mayle discovered, in the off-season the Luberon is all yours - there will not be crowds, but there will be truffles and fabulous dinners. And in every month there are days when it is warm enough to eat outside in the Provencal sun. When it is cold, you will appreciate the under-floor heating, the mist hanging in the valley below, the odd wisp of smoke punctuating the scene. The price of the rental includes everything: all utilities, local phone calls, satellite TV, towels, bed linen, after-stay clean. Please note - this house is only suitable for a maximum of 2 people, and there are too many things for a small child to break. We are mainly British, we live and work in Oppede, which is 10 minutes from Menerbes where the house is situated. It was a complete ruin with a fantastic view and one tiny window. We gutted it, remodelled, made big windows and a little terrace and balcony. Now it is a wonderful spot, still with that amazing view, in one of Provence's best villages. The view; the fact of being in a quiet location but only 2 minutes' walk to the village centre; the little terrace and off-street parking spot; sitting on the terrace watching the sun set down the valley. For stays over a week, linens and towels are changed weekly. Great view, lovely space. The ascent up to the parking spot is so narrow, I decided against driving up to it after the first night. Hi Joyce, thanks for your feedback, I'm glad you enjoyed your stay. As you say the last 10 metres of road to the house was not built for wide cars, and that is why I advise guests to rent a smaller car than the one you came in. That said it is all down to habit - some people park at the house in a 4x4, others prefer to park just around the corner where the road is wider. Hope to see you again soon in Provence! We are not "low maintenance" travelers and have very high standards.... Menerbes One as this small home is called exceeded all our requirements. Gorgeous views, comfortable bed (oh, that duvet, heaven! ), washer/dryer (took some time to figure out), reliable speedy WIFI, great shower, and you can walk to several restaurants, coffee in the morning and of course the bakery. Though the unit has a parking space, the road to it was too narrow for our rental car (Paolo warned us)... basically you need a very small hatchback. We just parked 5 mins walk away in the village parking lot... there is also street parking 2-3 minutes away. I was a little worried as the most recent review was more than a year old, but don't fear, this place is definitely a wonderful option for your stay in the Luberon. Did I mention the views?? WOW. Just stunning. I am sitting here in the living room right now typing this, looking out over the fall leaves in the valley... no words can describe. We will treasure the days spent exploring the beautiful countryside and the evenings with lovely local wine on the balcony. Highlights were cycling through nearby villages, Coustellet market on Sunday was a real treat, Orange was a fascinating day and of course the beautiful produce of Provence was fantastic - full bellies every day! The Menerbes restaurants were all excellent and staff very friendly. Weather was amazing. But by far the best part of our holiday were the long evenings on the patio watching the sun go down and stars come out while sipping wine. Heaven!! This is the most beautiful property, it is exactly as described. It was warm and comfortable for our winter visit, albeit in spring-like weather. We loved the views, especially waking up in the morning and watching, through the little circular, as it got light. The village shops are very good and everyone was very friendly. Paolo is very co-operative and easy to deal with, by email. We will certainly return. Wir fühlten uns sehr wohl. Es ist an alles gedacht und einerseits praktisch, andererseits sehr liebevoll hergerichtet.Der Ausblick von der Terasse ist phantastisch. Included in the rental rates: bedlinen, towels, utilities, central heating, satellite TV, WiFi internet, local calls, visitor tax and after-stay clean. For stays over a week there is a complimentary weekly clean and change of bedlinen and towels.